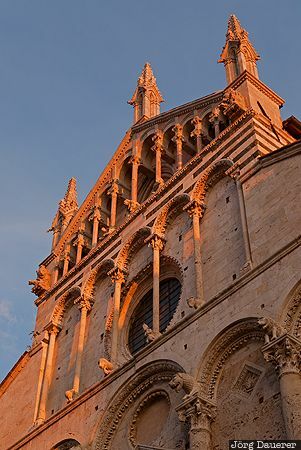 The facade of Massa Marittima Cathedral (Cattedrale di San Cerbone or Saint Cerbonius Cathedral) at Piazza Garibaldi with its columns illuminated by the last light of the day in front of a blue sky. Massa Marittima is in the province Grosseto in the southern part of Tuscany, Italy. This photo was taken in the evening of a cloudy day in October of 2009. This photo was taken with a digital camera.